The end of 2012 was supposed to be a moment when the world could celebrate having eradicated the polio virus. But instead another deadline has been missed. Three countries remain where the transmission of polio has never been interrupted - Afghanistan, Pakistan and Nigeria. Nigeria is being watched more closely than anywhere else: its cases reached a three-year high with more than 100 in 2012. The Bill and Melinda Gates Foundation, as well as Rotary International, are pouring significant money and effort into the global campaign to end polio. Cases are concentrated in particular pockets of several states in northern Nigeria. The young children who cheerfully thronged around me in Duhuwa village might yet be lucky enough to grow up in a world without polio. One of the community leaders proudly shows me a certificate marking his role in helping what are now vigorous immunisation campaigns in Nigeria. He told me through a translator: "We've had no polio cases here for 10 years. People here accept vaccination. "I'm very grateful to God that people are responding and accepting intervention." But in another village about half an hour's drive away, a mother of eight who teaches the Koran says suspicion still lingers that the drops of polio vaccine are a western plot to sterilise Muslim children. She has to immunise her own children in front of a wide audience, to win the confidence of other mothers. She said: "I gather a big group of extended families. I open the box of vaccines in front of them, and do my children first. If not, the women wouldn't accept it. "They fear that I give 'good vaccine' to my own children, and leave the rest for others. "Another misconception is that the jabs are a family planning method that will ultimately stop the children from giving birth when they want to." The polio virus invades the nervous system, and can cause paralysis in hours. Survivors often have wasted limbs. Even small drops in vaccination levels among children can lead to large outbreaks. That is why eradication is so important. Yusuf Yusufari is a health worker in Yobe, one of the north Nigerian states which has had polio cases this year - because parents have either refused the vaccine, or their children have simply been missed. Sometimes, he says, resistance comes down to a feeling that not enough is being done to tackle other basic diseases. Yusuf told me: "It's really challenging. Just when you think you're done with polio, it begins to show its face again. "Part of the mindset that resists vaccination is that it's some sort of global agenda linked with contraception. "The other perspective is that people witness lots of malaria. "They say - why are you bringing polio vaccination to my doorstep every month, but no anti-malarial drugs?" That standpoint has to be confronted head on, according to England's former chief medical officer, Sir Liam Donaldson. He is leading independent monitors overseeing the polio eradication efforts. Their latest report gave a blunt warning that Nigeria may end up being the last country in the world with polio. Communities should have their broader health needs taken into account by vaccination campaigns, the report recommended. There are though grounds for optimism that 2013 might be different. Fresh energy is being put into vaccine campaigns - even using satellite tracking to detect settlements where children might be missed. If we don't eradicate polio, I'll consider my legacy to be a failed one. Local staff who are deemed ineffective have been fired. And lessons are being learned from India, which marked a year without polio cases early in 2012. On his private jet, the Nigerian billionaire Aliko Dangote - whose business empire includes production of cement, flour and sugar - explained why he is involved in an initiative to double immunisation efforts in his home state, Kano. It is a hub for polio cases. 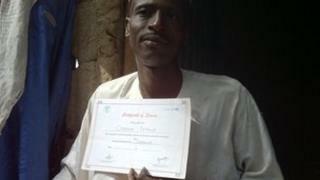 He said: "Most people you see who are crippled by polio are from northern Nigeria. "We now have the buy-in of the state governor, and I believe that Kano will soon have a success story. "I intend to go there and help with the polio immunisation exercise twice a year. I might even try to do more than that." It is 30 years since polio was transmitted in the UK. But in Nigeria, operations still have to be carried out on young polio survivors who need corrective surgery. Senior politicians are feeling the heat from the global campaign. In his office in the capital Abuja, I asked the health minister Dr Muhammad Pate how much he felt was resting on his shoulders. He said: "I feel my head is sticking out on this. If we don't successfully conclude the efforts in eradicating polio, I'll consider my legacy to be a failed one. "Polio eradication is do-able. Other countries have done it - therefore we can do it in Nigeria."